It’s silly to get excited about grocery shopping—it truly is—and yet those mundane errands we take for granted at home suddenly seem novel when we’re traveling abroad. Perhaps it’s the language barrier, or maybe it’s the promise of new and unfamiliar foods. Whatever the reason, it’s the first thing on my mind when I wake up this morning. 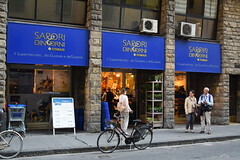 There’s a small shop just up the street from my apartment, with a blue and white awning that reads: Sapori & Dintorni, il Supermercato da Gustare e deGustare. It’s part of the Conad chain of grocery stores and as best I can figure, the slogan means “flavors and surroundings, the supermarket to taste and taste,” but really, it sounds best in Italian, far more elegant than the local Price Chopper in Vermont. Bring a cloth shopping bag. Check. Remember to use plastic gloves before handling produce. Check. 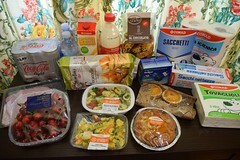 Bag your own groceries. Check. I also read something about ordering meats and cheeses over the counter at the salumiere, but at the moment I’m feeling too meek and too overwhelmed to try, worried I’ll get the fractions wrong and end up with a mezzo-kilo of ham instead of an etto. By the time I make my way to the end of the line, I’m quite pleased with myself. I’ve found all of the essentials on my list—latte scremato, spremuta di arance biande, sacchi nettezza, and carta igienica—and as I examine the labels and let the words roll over my tongue, I’m amused that the things I’m about to buy sound so much more impressive than milk and juice, trash bags, and toilet paper. I’ve managed to fill my cart with an array of other appetizing things, too, including focaccia bread and chocolate biscotti, as well as a few small custard tarts. My apartment has a tiny kitchenette with a two-burner stove and no oven, but there is a microwave, so I’ve also picked out a few packages of prepared pasta for quick and easy meals. Yes, I feel a teensy bit guilty buying such things here in the cradle of Tuscan cuisine, but let’s be honest… I’m no Mario Batali. Besides, I’m on vacation. Buoyed by the morning’s adventure, I drop off my bags at the apartment and head outside again, this time over the Ponte Vecchio and into the historic heart of the city, along Via Calimala and its plush shops, past Piazza dell Repubblica and its carousel, all the way to the Duomo. There’s a Vodaphone shop nearby and I need to recharge the SIM card I bought last year for my iPhone, as well as purchase another so that I’ll have access to data on my iPad mini throughout the month. 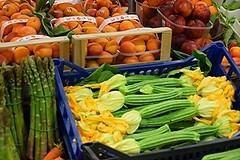 Afterwards, I head to Eataly, where I pick up a few more staples for the apartment, and then to the Mercato Centrale, where shopping succumbs to browsing and I spend a happy hour exploring the new first floor, with its artisan food vendors, wine shop, and cooking school. By the time I make my way back to Piazza della Signoria, it’s late afternoon. My legs are wearing out, but my list is nearly complete. I spy a black “T” in the window of a caffè facing the square and duck in to buy a few bus tickets, then I walk to the corridor next door to buy an Amici degli Uffizi card, which for €60 will give me unlimited access not just to the Uffizi itself, but to many other sites in town, including the Accademia and the vast complex of museums at the Pitti Palace. 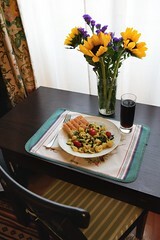 Back at the apartment, I warm up some pasta and sit down for dinner at the dining table facing the window, which I’ve improved with a vase of fresh sunflowers from the market. 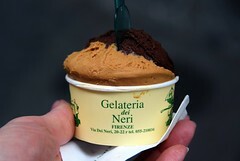 Afterwards, I take a slow stroll down to the Ponte alle Grazie and across to a well-reviewed ice cream shop on Via dei Neri. 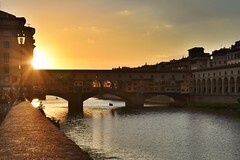 As I wander back, enthralled by the warmth of the setting sun on my face and the taste of dark chocolate and salted caramel gelati on my tongue, I think about how this is my fourth trip to Italy and how on each of the previous three, I had stayed in “tourist” Florence, where everyone smiles and speaks English, and there’s always a concierge to do the hard things for you, like booking tickets at the Uffizi, or calling to make a dinner reservation. This time, I’ve made a point of striking out on my own. It may seem like a trivial thing, but I’m proud of my success. All of the mundane tasks I’ve accomplished today—the grocery shopping, the SIM cards, the bus tickets, and museum passes—have been a good investment. I’m preparing myself for the next four weeks, getting to know my surroundings, and gaining confidence in my skills. In short, I’m learning to survive outside of captivity, and all of the sudden, the possibilities of life in the wild feel endless and intoxicating.